Cephalomanes javanicum (Blume) C.Presl, Abh. Königl. Böhm. Ges. Wiss. Ser.5, 5: 334. 1848; Bosch, Hymenophyll. Javan. : 30, t. 22. 1861; Ching, Fl. Reipubl. Popularis Sin. 2: 189, pl. 14, f. 1–4. 1959; Tagawa & K.Iwats., SouthE. Asian Stud. 3(3): 74. 1965; Tagawa & K.Iwats., SouthE. Asian Stud. 5: 43. 1967; Tagawa & K.Iwats., Acta Phytotax. Geobot. 23: 52. 1968; Tagawa & K.Iwats., Fl. Thailand 3: 96. 1979; Boonkerd & Pollawatn, Pterid. Thailand: 25, 67. 2000. – Trichomanes javanicum Blume, Enum. Pl. Javae. : 224. 1828; Bedd., Handb. Ferns Brit. India: 44, f. 21. 1883; Christ, Bot. Tidsskr. 24: 103. 1901; C.Chr., Bot. Tidsskr. 32: 340. 1916; Copel., Philipp. J. Sci. 51: 246, pl. 52, f. 1. 1933; Tardieu & C.Chr., Fl. Indo-Chine 7(2): 68. 1939; Holttum, Rev. Fl. Malaya ed. 1, 2: 102, f. 38. 1955 [‘1954’]; Holttum, Dansk Bot. Ark. 20: 17. 1961. Lithophytic or terrestrial, often in stream beds. Rhizome erect, bearing many wiry roots and a tuft of fronds. Stipes wingless, dark stramineous, covered with dark brownish hairs, 0.8–1.2 mm in diameter, 5 cm or more long. Laminae pinnate, lanceolate in outline, gradually narrowing both upwards and downwards, 10–20 cm long, 2.5–4 cm wide; rachis very narrowly winged, sparsely hairy; pinnae many, with very short stalks, oblong-lanceolate, round at apex, unequally cuneate at base, serrate at margin, up to 2.5 cm long, 0.8 cm broad. Sori on acroscopic side of the upper pinnae, 2 to 5 on each pinna; fertile pinnae deeply cut on both sides of each sorus, sorus placed at apex of a lobe and the tips of involucre on the line of the edges of pinnae; involucre tubular, truncate at mouth, narrowly winged, thick in texture, 2 mm long, 1 mm diam. ; receptacles very long extruded. SOUTH-EASTERN: Chanthaburi, Trat; PENINSULAR: Ranong, Surat Thani, Phangnga, Phuket, Trang, Satun, Yala. On sandy slopes or on wet muddy rocks by streams in dense evergreen forest at low or medium altitudes. Middleton et al. 4621, Trat, Ko Chang, Trail from Khlong Phlu Ranger Station (E). Long et al. CL534, Koh Kong (P). 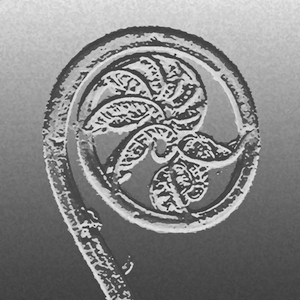 Frond showing position of sori.